Discovering that Spencer Proffer, the producer of their debut LP, Vices, only had time to mix their new record Welcome to the Club, didn't unduly upset Canadian rockers Kick Axe. Recording the vocals and the rhythm tracks in Toronto with Proffer associate Bishop, then following the tapes to L.A. to lay down lead guitar and special effects with their old mentor, meant the band had more input in the direction the album took says drummer Brian Gillstrom. "And once the tracks were recorded, he couldn't do anything about it," he chuckles. Not that there's any acrimony between the quintet who will be bringing "a lot of heavy explosions" to the Jubilee Jan. 1 and heavyweight producer Proffer. 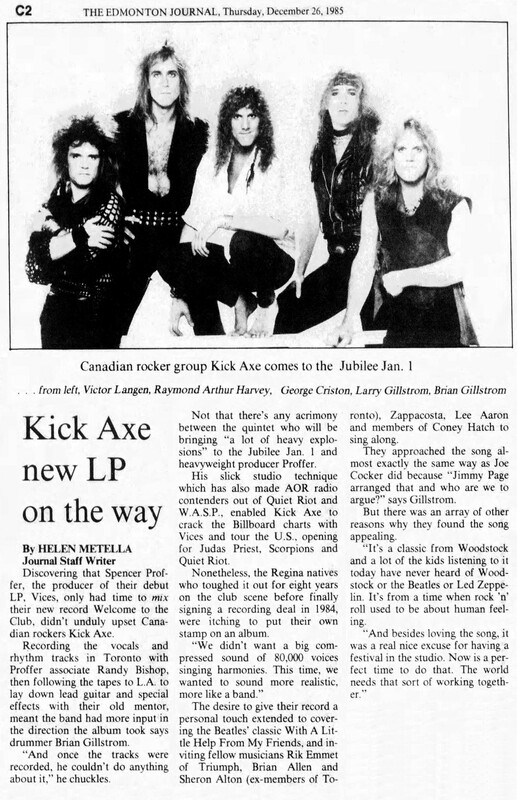 His slick studio technique which has also made AOR radio contenders out of Quiet Riot and W.A.S.P., enabled Kick Axe to crack the Billboard charts with Vices and tour with Judas Priest, Scorpions and Quiet Riot. Nonetheless, the Regina natives who toughed it out for eight years on the club scene before finally signing a record deal in 1984, were itching to put their stamp on an album. "We didn't want a big compressed sound of 80,000 voices singing harmonies. This time we wanted to sound more realistic, more like a band." The desire to give their record a personal touch extended to covering Beatles' classic With A Little Help From My Friends, and inviting fellow musicians Rik Emmet from Triumph, Brian Allen and Sheron Alton (ex-members of Totonto), Zappacosta, Lee Aaron and members of Coney Hatch to sing along. They approached the song almost exactly the same way as Joe Cocker did because "Jimmy Page arranged that and who are we to argue?" says Gillstrom. But there was an array of other reasons why they found the song appealing. "It's a classic from Woodstock and a lot of the kids listening to it today have never heard of Woodstock or the Beatles or Led Zeppelin. It's from a time when rock 'n' roll used to be about human feeling." "And besides loving the song, it was a real nice excuse for having a festival in the studio. Now is a perfect time to do that. The world needs that sort of working together."